Recently a student with about a year of training asked me if I thought he was making any real progress in karate. It's a fair question given that it's difficult to be truly objective about ourselves. Self-assessment always runs the risk of being filtered through certain biased tendencies, such as doubt, ego and denial. So then it's to be expected to look outside of ourselves for some genuine feedback. But even when approval from a qualified source is received there's occasionally some lingering doubts. Are we in a position to judge ourselves? Has anyone ever received a belt they feel they didn't deserve? Videotape yourself. I can't recommend this enough. Whether you're interested in improving your sparring or rolling skills, a taped rendition of your performance on the mat will give you a fresh perspective. Prepare yourself to cringe at mistakes you had no idea you were making, while at the same time express surprise at how well you do certain things. Keep a written log. When I started training I was given a manual with most of the techniques needed to advance through the ranks. Make it a point to note which ones need work and detail a routine to fix these deficiencies. If you're training primarily for fitness and health benefits, record the number of basics, pushups, and crunches you're able to do over a period of time. Slow down. When I see somebody flying through kata at warp speed I suspect they're trying to conceal something, albeit unconsciously. The next time you work your form, slow it down as if you were performing tai chi movements. At some point actually stop midstream and look at what you're doing. Is your back straight? Are you bending your knees to their proper depth? Are your toes pointing in the same direction as the target of your hand strikes? It's the details that count. While it's true that there are "advanced" techniques in any martial-art style, the real litmus test of expertise is to be found in how well a student performs the most basic exercise taught at the white belt level. Don't be so interested in learning something new - that will come in its own time. Rather perfect the techniques that you're covering right now, no matter how mundane or ordinary they may seem. Remember, the authentic expert is a master of the basics. Slow down. When I see somebody flying through kata at warp speed I suspect they're trying to conceal something, albeit unconsciously. The next time you work your form, slow it down as if you were performing tai chi movements. Amen, and amen! 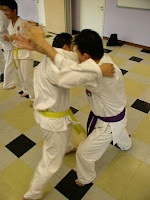 Some of the toughest things we do are things in slow motion: kata, kicks, everything. Any weaknesses in balance, especially, are greatly magnified. Doing things really slow really forces you to examine exactly what you are doing. That's right. Just because you can do it fast doesn't mean you can do it slow. Musashi supposedly said, "fast is slow and slow is fast." I take that to mean that training fast makes for slow progress and training slowly makes for quicker progress. Another great saying that pops up in my practice often is, "it doesn't matter how fast you go as much as when you get there." Slowing down is key. I know what you mean by students racing through their katas. Our instructor, luckily, made them redo it at extra-slow speed just to make sure they actually had all the correct moves in there. Plus, if they're doing it so fast, how can their moves (strikes, kicks) be accurate? Unless of course they are highly advanced. Still, is he making progress? Training slowly makes such a huge difference. I often find that when I'm teaching a kohai a new kata I often have to stop myself and go through the movement quickly because I've forgotten how to do it slowly. What a lesson that is! And quite humbling. Going slowly through all of the basics makes for much greater muscle memory retention, too. If you go through something too fast your body forgets what it's really supposed to be doing. Great post! Video taping and keeping a log have both been VERY helpful for me. All three are very good. Especially number 3 IMO. Much of the advanced stuff will not work if you don't have the basics down to the point of not thinking. This is all such great advice. As a newbie it is easy to get caught up in the whole "teach me something new" process instead of really perfecting basics. They are SO important for everything that comes later. I have definitely had a promotion here or there that made me feel unworthy of it. I'm hoping Shodan is a completely different story. One thing I have done since beginning is to produce DVD's of belt promotion tests and provide copies to members of the school I attend. It's amazingly helpful not just to see my own progress and note the areas needing more work, but these recordings are also visual learning aids to study the next levels of kata and technique. Slow is good. I find much more satisfaction in executing and holding a slow-count kick or deep stance than racing to the end! I love your advice, and I have done many of the things that you suggest quite often in my training history.... they work well. Especially videotaping myself.. I found that it revealed many things to me that helped me to improve my performance. When I read the phrases "Are we in a position to judge ourselves? Has anyone ever received a belt they feel they didn't deserve?" I had to wonder some aspects. a) People always judge themselves. Most of the time, in some aspects, we are harder on ourselves than on others. If you ask a person to list what they'd like to change about themselves, many will have no problem creating a list. Ask them to list the things that they are proud of, and many people come to a stumbling halt. We can easilly be too demanding on our training, and forget that good skills take time, and patience to develop. b) No one deserves a belt rank (in my opinion) A rank is a symbol of recognition or in other words, it shows that a person recognizes something in you. Therefore, rank shows that in the mind, and eyes of this significant person (Master/Sensei) you have showed forth a certain aspect that they recognize as being of a particular level of achievement. If you value that Master/Sensei's opinion, then you will accept their judgement, and continue exhibiting, and improving the skills that you have been performing up until now. If you doubt that Master/Sensei's assessment, then perhaps you might want to look into training under someone whose opinion you would accept. If you doubt that Master/Sensei's assessment, then perhaps you might want to look into training under someone whose opinion you would accept. Yes. I'd like to add that finding a genuine master is no easy matter. But if you find one it's worth the search.